Thank goodness there are so many great ways to "get some". During the summer months many snowboarders like to engage in activities that simulate the skill and rhythm of snowboarding. These alternate sports are not only enjoyable, they are another way to push your progression mind state. Finding new activities where you have to practice and learn and fall and get back up in the quest for skill progression is great practice for the process of getting better at lots of things one challenge at a time. Snowboarding Cross Training - Skateboarding -A parent sport to snowboarding, skateboarding is radical. Ha, that is a funny word, Radical. But it is. It is challenging and fun. Great for practicing pumping transitions, sliding rails, riding ramps and pushing your skills, skateboarding is incredible cross training. It uses many of the same body movements as snowboarding and if you can rise to the challenge of doing tricks on concrete, snowboarding seems that much easier, being that it is on snow. Snowboarding Cross Training - Surfing -Incredible exercise and the challenge of first catching, then reading the face of a wave and adjusting to stay on it is rewarding in an entirely different and soulful way. Being one with the ocean and finding that rhythm is good practice for being on the mountain. Snowboarding Cross Training - WakeBoarding -More than any other sport, wakeboarding is incredible practice for the gymnastic efforts of doing tricks. Wakeboarding is all about doing tricks. Although in many ways, it is quite different than snowboarding due to the nature and physics of being pulled by the boat instead of gravity. It is still great for learning another way to get in the air, rotate, ride switch, do grabs and so on. The only draw back to Wakeboarding is that the impact of landing on flat water can be fairly extreme. Your knees only have so many flat landing in them so it is important to limit how much you punish them. Have fun, but try hard to land on that opposite wakes transition for a smooth touchdown. Going out to the flats on a regular basis can shorten your wakeboarding and snowboarding days. Snowboarding Cross Training - Wakesurfing -I have totally fallen in love with Wake surfing. I have been doing it for 2 full summers now, and just love it. It is low impact and difficult. Not too difficult to do, in fact it is pretty easy to learn to get up and make turns. Wake surfing progression leads to the day when you learn to actually ride the wave, and throw the rope back into the boat. That is a great day. Accomplished wake surfers can actually throw the rope, then pump into a board sliding spin and recovery in the face of the wave and keep surfing. Some can also do airs with grabs without the rope. It is amazing, great exercise and oh so fun. 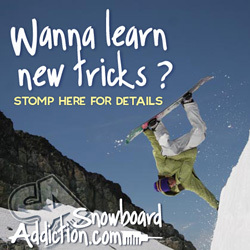 Snowboarding Cross Training - Long-Boarding -Nothing simulates the feel of carving a snowboard like ripping through a parking lot or down a smoothly paved hill. Long boards are carving machines. They have flex and bend with the g forces of the turn. With a smooth bouncing flex from turn to turn, it really feels like arcing a snowboarding on smooth groom. Go on set up some cones and rip it up. Snowboarding Cross Training - Gymnastics -Body and air awareness, strength building, flexibility building and some kung fu skills to top it off. Jumping into a gymnastic program can really benefit the progression of snowboarding skills. Especially if it is a program designed to cross train for snowboarding, like the programs at Woodward. Artificial Surface Ramps into Water or Foam Pits -There are several types of jump training ramps. Here in Steamboat we have a plastic surface ramp with kickers into a lake. Lake Placid and Park City also have more advanced versions of this setup into pools. Another area that Woodward is leading the way is in artificial surface jumps. At Woodward facilities, Windells’ Snowboard and Ski Camp at Mt Hood, the USSA Center of Excellence in Park City and a few other select facilities around the world you will find foam pits for jumping into. Some are set up with skate ramps for use with a skateboard or rollerblades; others are artificial surface for riding your snowboard or skis on. They all have jumps into the foam pit and can be super useful for working new tricks with a high probability of head landings. Plus, they are super fun. Trampolines - In my snowboarding cross training programs in Steamboat, we have always used trampolines extensively. On a trampoline a rider can practice trick maneuvers over and over and over in a fairly safe and confined area. It is very predictable and it fun to do the basic skills building exercises while you develop at feel for the tramp. Gaining confidence during hang time and becoming more and more comfortable with spinning and flipping. Learning to let your body adjust and gyrate in what every way needed to get your feet back under you. You should not underestimate the value of trampoline in snowboard cross training. Check out the foam tramp board that Tyler is using in the photo to the left. These are great for practice with getting your grabs through spins and flips. If you want to get one, check out Trampoline Parts and Supply , and search for bounce board. Bounce, bounce, bounce....... Its good for you. Diving Boards -Last but not least, the diving board has many of the same productive possibilities as trampolines, only its has forward momentum and its okay to land straight on your head. Doing flips and spins and crazy moves on the diving board is just another of the great activities you can do to push your level. Progression and Goals don’t always come easy, but when you keep your training real and fun with activities like those on this page, it will come. Find the activities that you love and get you out the door on a daily basis. Push yourself to progress in every activity, and I promise you will improve. In more ways than you can imagine. Bring on the ideas and stories. What other things do you like to do to cross train for winter, and how do they help and relate to your snowboarding?